I came into the parish library today after work and found a book stuck in the Reference section that didn’t quite look like it belonged there. 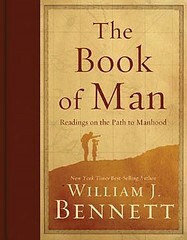 It was called, “The Book of Man: Readings on the Path to Manhood ,” by William J. Bennett. It’s a collection of writings meant to instruct today’s man in what it means to be a man, as well as providing some examples – mainly positive ones – to inspire our men and show them how to live out an authentic masculinity. I think I’ve fallen in love with the concept of the book already. There’s not much that I love and crave more than a man living as a man ought. Males and females are radically different, yet complementary, so the feminine part of me craves true masculinity. I’m not sure if I will buy this book (probably eventually), but I’m thinking that it might be more enjoyable to savor it. To read one section in it every time I come to church and write about what I learned from it, about what attracted me as a woman, and my hopes and dreams based on it for the men in my life. While leading Marines during Operation Iraqi Freedom, he learned that he didn’t gain the respect of his men from great feats or amazing acts of heroism, but consistency in his actions – an internal integrity which spanned from the largest decisions to the routine actions of everyday life. He also showed how both he and his men often had to show restraint, even when that choice could result in their own death. They would make decisions that put them in greater harm, so as not to harm civilians; and they would rush to the aid of others, even if that meant making themselves a target. He also shows how men, especially when fighting together, form bonds and back each other up. Real men are supportive and reliable – you can count on them to be there and to do what is right. The end of the passage is summed up with the Marine Corps motto: Semper Fi. Always faithful. Which is an excellent quality in a man. Categories Neat Things I Didn't Author, Of Vice and Virtue•Tags "The Book of Man"